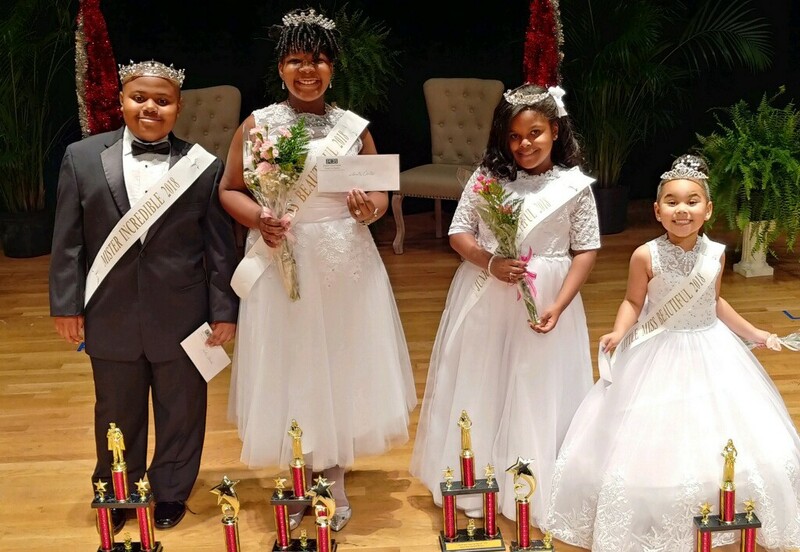 L-R Front: Danita Joelle Carter, Justin Matthew Edwards, Kayera Nicole Young, McKenzie Camille Williams-Davis, Ilana Malise Tyson and Khloe Karissa Teter. Kenya Cabine – Interim Program Director of WEAS and WTYB Cumulus Radio Station Group/E93 and Dr. Patricia M. Harris, Pageant Coordinator. Savannah Civic Center’s Johnny Mercer Theatre was the scene of Delta Solutions, Inc. and Tigers ROCK Group’s signature “Unforgettable Pageantry” event, “UNBELIEVABLY AMAZING!” On Saturday, June 16, 2018 contestants from ages 4 – 12 graced the stage in a stellar performance in support of the charitable pageant event. Through their dedication and commitment to the cause, and through community supporter’s generous contributions, the organizers had the pleasure of providing community service, support community programs, award scholarships, contribute to organizations whose focus is service to community members diagnosed with disabling diseases, mental health issues, and adults and youth in need of health and educational care services. Additionally, the organizations’ mission, through this pageant, was to give young people the opportunity to showcase their talents, believe in themselves, reach for the stars and learn the essence of giving and receiving while demonstrating their care and support for others. Contestants were vying for the title of Little Miss Beautiful, Junior Miss Beautiful, Miss Beautiful and Mr. Incredible. Winners of the pageant will participate in a major community service project with Miss Black Georgia US Ambassador, Ashleigh Montford, represent the organizations in community service events and also be ambassadors of peace and love for upcoming community events sponsored by Delta Solutions, Inc. and Tigers ROCK Group. The “Unbelievably Amazing” Contestants are saluted for their performance! The winners are to be congratulated for a beautiful pageant that is just the beginning of new found pageantry in the Hostess City of the South.